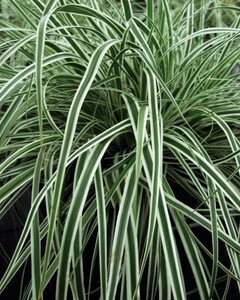 description for "Rushes and Sedges: Carex oshimensis 'Everest' PP20,955"
Fountains of narrow leaves with wide, pure white leaf margins spill over to form compact clumps. A shade-loving grass, Variegated Japanese Sedge 'Everest' is lovely planted along a path, adds an architectural element to containers and window boxes and also suitable for mass plantings. Reaches 12 inches tall with an equal spread. Part sun to full shade. Zones 5-9. Edited by M.Tate. reviews for "Rushes and Sedges: Carex oshimensis 'Everest' PP20,955"